The perfect warm weather party wine? A sign of the times in the retail wine trade? Wine Riot: What are you doing this weekend? Which Grocery Stores in MA Sell Wine? As we come into warmer weather, I'm enjoying firing up the gas grill and enjoying some time outside. I tend to choose wines seasonally rather than pairing them specifically with the food we're eating, and this spring in particular, two varieties that really seem to have a lot of buzz are Riesling and Sauvignon Blanc. When I think of Sauvignon Blanc, quite a few good regions come to mind. France (Sancerre- read more here from RJ's Wine Blog), California, and New Zealand all produce strong wines from the Sauvignon Blanc grape. Keep in mind- there is no additional tax on wine in MA. Kim Crawford is a man, not a woman. Kim Crawford Wines was acquired by Canadian conglomerate Vincor International in 2003, and in 2006 Constellation acquired Vincor. Kim Crawford himself no longer works for Kim Crawford Wines. Since 2008, Matt Large (who worked with Kim for several years) has been the winemaker. 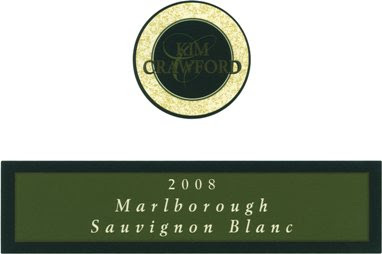 You can follow @KimCrawfordWine on Twitter. They're nice, helpful folks (thanks for the label and the information about the brand!) but just so you're aware, the Twitter account is for the brand and not Kim Crawford himself. If you like this one, you might also enjoy this outstanding 96 point/$29 California Sauvignon Blanc. Question of the Day: What are some of your favorite summer party wines? James Laube of Wine Spectator recently blogged about (subscription required) a wine that caught my attention. While conducting a blind tasting of 20 or 30 California Pinot Noirs, one stood out to him as being "very good"/"excellent". That in itself isn't extraordinary- he tastes great wines all the time. What was unusual about the wine was that it costs only $8 and they make a lot of it: 35,000 cases. You'll find the 2008 RedTree California Pinot Noir in the bargain bin at your local wine shop or grocery store. Especially in the Pinot Noir category, where it is hard to find a good bottle under $20, this is a significant accomplishment. Only one domestic Pinot Noir producer achived 90 points according to Spectator for $20 or less in current vintages, and you need to get to $30 before 90 point ratings become commonplace. We'll see where his final rating eventually falls. Judging from the words he chose, it sounds like it will be in the high 80s, which would make it a "Smart Buy" for sure. But if he rates the wine 90 points, it would set off all kinds of alarms as being quite possibly the most extreme QPR (quality price ratio) wine in recent memory. Update: (5/5/2009) Wine Spectator revealed an 88 point rating ("Very Good") for this wine. It was in pretty good company, with wines cost between $26 and $55. I stopped in at Cambridge Wine & Spirits the other day (next to Whole Foods Fresh Pond in Cambridge, MA). After combing through the Pinot Noir section, I was unable to find it. However, the reason I couldn't find it is that it was in the bargain bins with a big orange sticker on it: On sale for $7.99! If the video fails to embed, try here. I had some more of the wine after shooting the video, and my impressions were that the wine had limited aromatics even after an hour or two. Some light fruit on the nose, but missing (for me) were the earthy and spice aromas that are typical of some of my favorite Pinot Noirs. On the palate, it was certainly smooth and enjoyable- not at all harsh. Fruity, with a nice slight pucker in the mouth that gave it an enjoyable finish. The next day, after screwing the cap on overnight, the wine held up surprisingly well. It was slightly more aromatic, both with fruit and some oak that I didn't notice the night before. Overall, I'm thinking that this wine would be a great, light, low alcohol (12.5% whereas 13-14% would be more typical of California Pinot Noir in my experience) summer party red wine. At $8 a bottle it is certainly one to consider. If I had to rate it, I'd probably go somewhere in the mid-80s. Probably 85. Other perennial Pinot Noir values at a similar price point would be Mark West and Castle Rock, although they typically come in a little over $10 in the Massachusetts market. Willing to spend a little more? Here are some of my favorite $20 Pinot Noirs. Has production of Pinot Noir caught up with the demand created by Sideways? Are we going to be seeing more good Pinot south of $20? Or even $10? I give Laube a lot of credit for being so open about his thoughts on this wine. I can imagine he was shocked when he took the brown paper bag off and saw the price on the bottle. Through his blog, we've been able to get a feel for what things are like inside Wine Spectator's tasting offices and I think that enabling this connection is smart business for the magazine (especially with so much controversy swirling around the wine trade these days). I think this also makes it evident that Wine Spectator mixes up price points sufficiently in their blind tastings. I've heard some accusations that they excessively sort wines by their price prior to grouping a blind tasting, in order to avoid the possibility that they'd give an expensive wine a low rating and vice versa. See Wine Spectator's Executive Editor Thomas Matthews' response to this accusation at the end of the comments section of this blog entry. The results of this tasting are precisely why I subscribe to Wine Spectator and follow their ratings. Crazy things can happen when you taste blind, and I enjoy discovering the value surprises they offer up for consideration. domaine547 also blogged their reaction to this. Check it out. You might also be interested in this live tasting I did of the 2005 Paso Creek Merlot (which Wine Spectator panned but Gary Vaynerchuk loved). Do you like hearing discussion about hot wines like these? Consider a free subscription to the Wellesley Wine Press and you'll never miss a update. Question of the Day: Have you tried this wine yet? What do you think of it? What do you think about Laube being so openly positive about his positive impressions of an affordable wine? What do you think about Wine Spectator's blind tasting policies in general? I'd love to hear from you. Thanks for stopping in. I subscribe to as many E-mail wine deal newsletters as possible. Even if I'm not able to take advantage of many of the offers given that I live in MA, I find it interesting to keep up on wine deals from around the country to see what's going on in the wine business. Recently, I received the following newsletter from a retailer that I wanted to pass along. I made some minor modifications to it to keep the identity of the retailer anonymous, and asked for the retailer's permission to re-publish it. I thought it was incredibly authentic, enlightening, and indicative of the reality at hand for the wine trade today. "What else is going on? Where to begin? Well, a year ago, my largest wholesaler, bending to pressure from the largest chain wine/liquor store in the state refused to sell me anymore deals. Apparently a tiny “one man operation” posed much too many obstacles for a decades old operation with hundreds of locations. You might guess I am being paranoid but I actually have the e-mails from the chain, to my wholesaler and then, eventually, an e-mail from my wholesaler telling me that if the chain can not control my pricing, then no more deals. I can buy deals from other wholesalers but not on the recognized name brands that you have become accustomed to. My sales began to plummet, partially because of low consumer confidence and largely because of lack of what I built my business on, tremendous deals. The deals I did get sold out much slower than before as people began cutting back on spending across the board. To give you an idea of how bad it has gotten, in March 2008, I did $36,000 in sales ON ONE DAY! In the entire month of March 2009 I did $28,000 in sales. I know I positioned my business as a convenient, “buy thru e-mail” operation but I have to generate enough walk in business to cover my fixed monthly expenses like rent, insurance, utilities, loan payments, etc. before I can even consider spending $20-$30K on a large deal that likely will take me ten weeks to sell ~vs~ ten hours a year ago. Quite frankly, lack of sales volume and even lack of customers buying 2-3 bottles is driving me to the precipice of going out of business. It is hard to fathom considering a year ago I was flying high and posting double digit sales increases every month. I haven’t broken even one month since then. Today is my Birthday. I am 43. Over the last twelve months I have lost a wife, my health and seen my business come unwound and nose-dive towards insolvency. I don’t know if I have the right to complain because six of my customers fought cancer in the past year and some of them didn’t survive. So I have very little to complain about all things considered. But I don’t want to let a big chain squash me like a bug. If I lose this business, I lose a rather large sum of my parent’s retirement fund and also all of my life’s savings. I would likely lose the house I have called home for 13 years and everything else I have worked 21 years in the wine business to build. So I implore you, I will even swallow my pride and beg you, please buy your wine here even if I am not promoting a half price deal at the moment. The support I get on a daily basis allows me to have cash flow to buy big deals and also pay the rent, etc. My prices are on the low side of fair meaning you are unlikely to find lower prices at any other retail store in town on the same products and more importantly, you personally hold the welfare of me and my family in your hands. I have always tried to offer good service, selection and fair pricing. Certainly the stress of the last 12 months has worn on me but I want to let you know that each and every one of you is very important to me, both as customers and as friends. So I am making one last attempt to salvage the store over the next 60-90 days. Please support me any way you can. Even bottle purchases help very much. Remember we have good deals starting at $5 a bottle all the time. Now, I'm the first person to dismiss the notion of supporting "mom and pop" retailers for the sake of supporting the little guy. In my view, each component in a wine distribution chain needs to provide value, otherwise why should we support it as consumers? However, the situation described in this newsletter is striking to me because it is eerily similar to how I would run a small wine shop. Offering deals, running the business lean, and maintaining personal relationships with customers (especially over the Internet) are exactly the things I would do if I had a wine shop. However, this retailer is being squeezed by a larger retailer and their seemingly anti-competitive business practices. Since when was this acceptable? Adjacent to this, I'm always surprised when local wine stores don't want me to re-publish their deals on this blog. "Why wouldn't stores like free promotion?" I think to myself. Isn't the upside of reaching more customers greater than the prospect of a competitor intercepting the details of an offer you're running? However, in light of E-mails like this one, I can see why wine stores can be cagey about revealing their deals. There are larger forces at play in the wine trade, and the net effect of this is higher prices for consumers. And that is something I can't get behind. Question of the Day: What do you think of this situation? 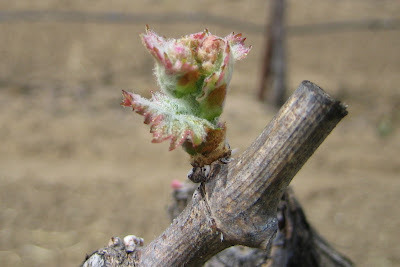 10-Second Summary: Lewelling Vineyards in St. Helena, CA is a small production family vineyard focused on growing grapes -and- two highly rated Cabernet Sauvignons. An appointment is needed, but you'll enjoy a relaxing, personal tour and tasting in a casual setting. The things I'm looking for in a winery visit aren't easy to find in Napa. I like visiting small wineries where you get to talk with people who give you authentic insight into what the brand is all about. When planning a recent visit to Napa, I recalled this forum thread on the Wine Spectator forums where people shared some of their favorites. Lewelling was mentioned several times, most prominently by Dave Tong. Through the magic of Twitter, I was able to connect with Dave more directly and he re-iterated his recommendation for Lewelling. So I called Lewelling Vineyards up and they were happy to accommodate a tasting and scheduled an appointment straight away. I had a feeling I was going to like this place when I received directions to their property which included mention of a "bumpty dirt road". 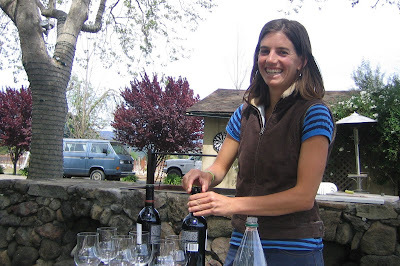 We had an afternoon appointment with Haley Wight, Assistant Winemaker and 6th generation member of the Lewelling Family. When I called to see if we could come early- "Sure- no problem!" she said. I think we were the only tasting appointment that afternoon. We started off our tour with a short walk around the property, and Haley told us about the history of Lewelling. Her family has continuously farmed the property since 1864. Around 1950, Janice Lewelling Wight and her husband Russ built a home on the site and replanted the vineyards. Today, Russ and his 3 sons Alan, Doug and Dave farm 28 acres of almost entirely Cabernet Sauvignon grapes on the site. Lewelling Vineyards is situated between Highway 29 to the east and beautiful hillside terrain to the west. In addition to the vineyard area, 200 acres of forested hillside is left untouched to provide a habitat for plants and animals as part of their sustainable ranch management and farming practices. As we were walking around, I couldn't help but think of some of the impersonal, crowded tasting rooms along the nearby main drag. Lewelling is very close to the highway (not far from V. Sattui where we had lunch) but it's off a couple of side streets- far enough that they don't get drop-in visitors. 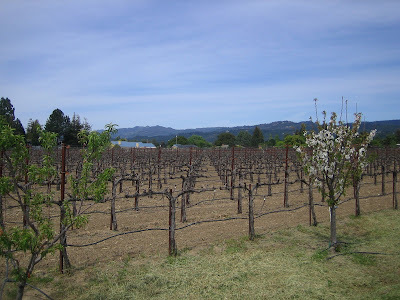 It was a beautiful time of year to visit Napa, just as the buds were breaking on the grape vines in this part of the valley. After our short walking tour we had a seat on a picnic table behind the house to have a taste of their wines. The majority of their grapes have historically been sold to producers like Caymus, Viader, and Beaulieu, but they do make 2 wines of their own- both Cabernet Sauvignons. They make their wines in a nearby custom crush facility, so they don't have a winemaking operation on site. The first wine we tasted was the 2006 Lewelling Cabernet Sauvignon. It is almost all Cabernet Sauvignon- 97% with an additional 3% Cabernet Franc. It was aged for 16 months in oak barrels. It was incredibly smooth and luscious (and not very tannic) especially for such a young wine. I was surprised to learn that it contained 15.3% alcohol (I'd consider 14% average)- it wasn't at all "hot". 906 cases were produced. The 2006 Lewelling Cabnernet Sauvignon Wight Vineyard was the 2nd wine we tried. It was a gem. Really- one of the best Cabs I've ever had. It had everything the previous wine had, but brought it to a higher level with more backbone and mouth filling flavor. It was a more serious wine. Big and bold while still being delicious and well-mannered. Fabulous. 95% Cabernet Sauvignon/5% Cab Franc. It too clocked in at 15.3% alcohol, but was aged longer (for 20 months) in 100% new French oak barrels. 541 cases were produced. Lewelling hadn't popped up on my radar screen previously because I rely on Wine Spectator ratings more than Robert Parker's Wine Advocate. Wine Spectator hasn't rated a Lewelling wine since 1996, however Robert Parker has been rating both of their wines every year lately. Their wines have received 90 points or better from Parker every year since 2002. 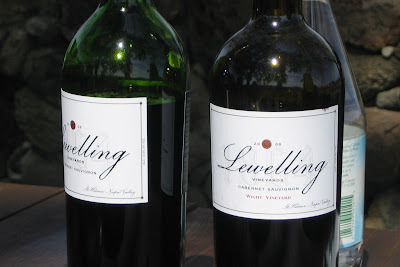 Their 2004 Lewelling Vineyards Cabernet Sauvignon Wight Vineyard received 96+ points. Parker loves this stuff, and considers it quite a value to boot. Coincidentally, I believe I've seen their wines available for sale at a local wine shop recently ('04s and '05s). The Wight at $99 and the regular at $59. The shop I saw them at regularly runs 20% off sales, so $48 and $80 (with no additional tax) would be reasonable rules of thumb for street pricing in the Massachusetts market. If they can ship to your state, and you can get on their mailing list, it would be one to consider because their pricing is quite favorable. There was no tasting fee, which was amazingly generous given the high quality of their wines and the time we spent there. Unfortunately, no wines were available to purchase. They're already sold out of the 2006s we tasted, and their 2007s will be offered as futures to those on their mailing list in the fall of 2009. Overall, I would put Lewelling in my top 3 winery visits of all time. I'd recommend them to anyone looking to visit a premium producer of Napa Cab with a personal touch. Question of the Day: Have you visited Lewelling or tried their wines? Everyone jumps in- Thomas Matthews from Wine Spectator, fellow wine bloggers, Robert Parker and Jay Miller from Wine Advocate. It's quite a scene. Who knew wine was such an edgy topic? The Wine Advocate is a wine publication of considerable esteem, founded by Robert Parker. Along with Wine Spectator, I consider it to be one of the two most influential sources of wine ratings in the United States. It prides itself on refusing to accept ads and uses this fact as proof that its information is credible and untainted. Frankly, the issues raised in both of these pieces bother me. It's really lame to delete forum posts unless they are really out of bounds, and from what I can tell these posts didn't even come close to being objectionable. It would have been far better for The Wine Advocate to directly address the issues in their forum. Second are the issues raised related to Jay Miller and his hobnobbing with wine distributors at steak dinners. Robert Parker seems conflicted on this issue. On one hand, he wants to have breadth in the wine reviews he provides so he farms the job out to contractors like Miller, but on the other hand he espouses standards for The Wine Advocate that seemingly apply only to himself. He can't have it both ways- either everyone who reviews and writes for him is on the same page and conform to his standards -or- the ratings in his publication are suspect. I expressed similar concerns in a prior piece on the subject of whether all of The Wine Advocate's tastings are done blind like they say they are. The tenor of the responses to these inquiries from both Robert Parker and Jay Miller are disturbing. There's an air of aloofness, and they sound as if they think they're above the law. It also seems as if they are out of touch with contemporary norms of communication. Somewhat non-related to this, and in an effort to continually improve this site- I've been following along with "31 Days to Build a Better Blog" from Pro Blogger. Pro Blogger is by far the most useful and helpful source of information about blogging I've found on the Internet. By a mile. So if you're interested in giving blogging a try I'd encourage you to follow him on Twitter and read his site. Great stuff. At any rate, I mention Pro Blogger because of the irony associated with his recent recommendation to participate in a forum relative to the niche that I blog in. With folks being banned on The Wine Advocate for valid commentary, and (separately) Wine Spectator forums being (in my view) often crowded with snarky/sarcistic commentary that make it unenjoyable to wade through, I'm at a loss for where to turn for an interesting wine community. I've found that between subscribing to wine blogs I enjoy -and- interacting with likable and interesting people on Twitter that I've assembled a custom community that I can dial in just the way I like it. Which wine blogs are my favorites? I'm glad you asked. Here is my list of some of the best wine blogs on the Internet to get you started. 10-Second Summary: Cliff Lede Vineyards (pronounced "Lay-dee") in Napa, CA is an elegant yet quick and easy stop for a taste of Sauvignon Blanc and their highly rated Cabernet Sauvignon. For $20, you taste 3 wines ranging in price from $20 to $60. More expensive tastings and tours are also available. Earlier this week, I wrote a review of a highly rated wine from Cliff Lede Vineyards that I wasn't particularly fond of. In spite of my so-so experience with that particular bottle, and because so many people have said good things about this wine and the winery, I decided to visit them during a recent trip to Napa. 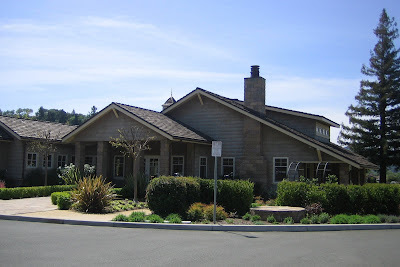 Their tasting room is located in Yountville between Route 29 and the Silverado Trail. Also included at the location is the Poetry Inn. I thought it was a beautiful place. The gentleman pouring the wine informed me that Sauvignon Blanc is one of the primary grape varieties used in white Bordeaux (more info from Wikipedia here), along with a more extensive run-down of other grape facts from France (Pinot Noir/Red Burgundy and Chardonnay/White Burgundy references, along with a full listing of all the red grapes allowed in red Bordeaux). I asked what typically differentiates California Sauvignon Blanc from New Zealand, and the answer was that they were pretty similar stylistically. He noted that the grapes were fermented in stainless steel and then concrete tanks to impart some minerality into the wine- I thought that was interesting. The Sauvignon Blanc was OK. Nothing in particular was too memorable about it. Typical Sauvignon Blanc- grapefruit and a bit of minerality with a clean finish. Not too tart. I thought it was a good wine, but not one I'd seek out north of $20. Next up were the Cabernet Sauvignons. One was from the benchlands of St. Helena and the other from more hilly terrain in Stag's Leap District. The St. Helena was said to be a mellower, smoother wine (given its easy going upbringing in the flat valley floor) whereas the Stag's Leap was going to be more tannic and denser given that it was grown in rougher terrain. I thought both wines were quite nice, showing characteristics of classic Napa Cabs. Fruit forward, yet serious. Full bodied yet restrained. The St. Helena was, for me, more approachable and rounder. The Stag's Leap was a bit more tannic, but not overly so. Neither of the wines displayed the excessive alcohol I noted in the 2005 I tried previously. While we were enjoying these wines we had some light conversation with the two gentlemen pouring that day (jokes about Rutherford dust in the glasses and such). We got a little bit of the backstory of Cliff Lede, but I don't really remember too much of it. There's some tie-in to rock music and the vineyards are named after famous rock songs. The tranquil surroundings seemed a bit disjoint to the Fender Telecaster on top of the wine bar. I didn't get it. One thing I always enjoy during a visit to a winery tasting room is the "secret bottle being poured *today only* just for you". It's as sure a thing as an encore at a rock concert (and this place was all about Rock 'n Roll, right?) A typical maneuver, and one that I enjoy very much, is to bust out the ultra-low production single vineyard designation wine available only at the winery and occasionally shared with wine club members. However, no such thing was offered to us. $20 each for the tasting fee and we were done. Perhaps this treatment is offered up to those willing to spend $50 or $70 on a tasting and tour as part of a tasting of their higher end "Poetry" line. I can't say that I was left feeling a special connection to Cliff Lede, and I don't think I'll be counting myself as a brand ambassador based on that experience. But that's okay- they've got plenty of fans and I do believe they make some very good wines. The $20 tasting fee is reasonable I guess and the fact that they offer tastings without appointment makes it a low-risk addition to a Napa itinerary. For more information on what I think constitutes a perfect wine tasting room visit (and a nod to my personal favorite winery visit to date) you might be interested in this piece on The Best Wine Tasting Rooms Anyone Can Visit. Question of the Day: Have you visited Cliff Lede? What did you think? I pay close attention to Wine Spectator ratings. I also follow Gary Vaynerchuk's Wine Library TV because I find it to be an excellent source of entertaining and informative information. Both of these sources have given high marks to the wines from Cliff Lede (pronounced "Lay-dee") particularly the 2005 Cliff Lede Stag's Leap District Cabernet Sauvignon. "Trying to decide which Cab(s) to open tonight: Cliff Lede, Hewitt, Buehler Papa's Knoll or Neal Family. Suggestions?" From @rjswineblog: "whoa - nice work. two of my favorites, the cliff lede and neal. love the cliff lede claret too. and all things neal." 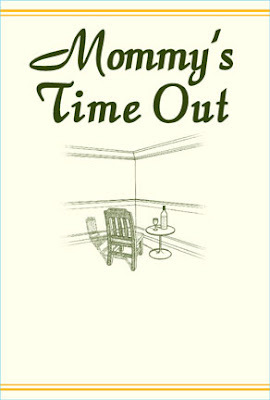 ... "hard to lose with cliff lede"
From @DaveTong: "vintages?" (they were all '05s...) "In that case, not the Neal. I'd probably go with the Cliff Lede." When all of these sources agree that a wine is great, I take notice. I recently saw a bottle of their 2005 Cliff Lede Stag's Leap District Cabernet Sauvignon on sale at a pretty good price at Blanchard's West Roxbury (somewhere around $45 tax included vs. a $50 release price for the '05) so I thought to give it a try. I had really high hopes for this wine since Spectator gave it 92 points, Gary gave it 92+, and heck even Robert Parker agreed- 92! When I cracked the bottle open, my first impression was that it was a little harsh so I let it breathe for an hour or two. While it was resting, we had a 2007 Merry Edwards Sauvignon Blanc and a 2006 St. Innocent Willamette Valley Pinot Noir; some lighter wines to start things off. By the time we got to the Cliff Lede, I was hoping that it would have mellowed out. No such luck. It was hot with alcohol almost the point of being searingly aromatic. Would you like to receive automatic updates of The Wellesley Wine Press? Click here to explore free subscription options. If you're interested in this wine, you may like this piece I did on my all-time favorite Napa Cab. Question of the Day: What do you think of Cliff Lede's wines? The Riot will feature 250+ baller wines from all over the globe in a snob free environment. Highlights include crash course seminars, tasty food pairings, twitter tasting, photo booth, dj and a special seminar VIP night on organic and biodynamic farming. I plan on attending the Friday night session. Hope to see you there! 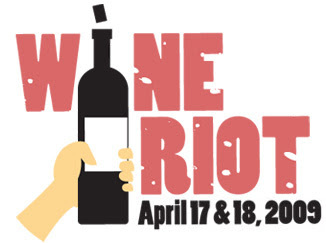 Question of the Day: Are you planning on attending Wine Riot? Definitely look forward to future stories from these visits. 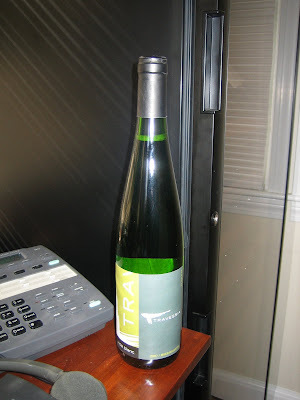 I received my prize for correctly guessing where in the world Travessia wine was. I'm looking very forward to trying this one and to learning more about this unique Massachusetts Urban Winery. We previously discussed diminishing returns with aging certain types of wine, as well as the importance of constant moderate temperature. A follow-up question in this area was vertical vs. horizontal storage of wine bottles- as in "How long is it safe to store a wine vertically?" Harvey Steiman from Wine Spectator has also weighed in on this subject, though you'll need a Wine Spectator Online subscription to see what he said. Great QPR here, and Wine Spectator liked this one even more than the ever-reliable Kim Crawford. I haven't had this one yet, but it's the perfect time of year to stock up on an affordable and delicious Sauvignon Blanc. Thanks to the reader who E-mailed me this tip. We previously discussed this wine in this blog entry. This is the first time we've seen this one in MA at such a low price. I have a couple of bottles of this I previously bought at a sale at Upper Falls in Newton. I think I'll crack one of them open to see whether I'd like to buy more- ratings on CellarTracker are looking quite good. Thanks for the anonymous tip on this one too! Here is a list of grocery stores in Massachusetts that sell wine. Further reading: Is Trader Joe's a Good Place to Buy Wine? Note: Membership *not* needed to buy wine at wholesale clubs in MA. Tip: Check the "New Items in the Warehouse" link on each location page for new arrivals in each wine shop. Thanks to the Costco Wine Blog for the pointer. These are the only two Donelan's that sell wine. I hope this list is useful. I thought to publish this after doing many variations on Google searches for "which grocery stores in ma sell wine?" You'd think the MA Alcoholic Beverages Control Commision would provide this list, but they don't seem very consumer focused in my experience. A side note on how difficult it is to track down these stores... I wasn't able to find this information on any of the grocery store web sites. Even when I'd call store headquarters, the customer care representatives weren't able to easily find the information, and in some cases they weren't able to find it at all. Whole Foods was the easiest- I just asked @WholeFoods on Twitter and they answered me within the hour. @Trader Joe's didn't respond on Twitter, but they did respond a few days later to an inquiry submitted through their website. Help prevent teen alcohol abuse – don't buy or sell alcohol for minors. I'd very much appreciate your help expanding this list. If you could drop me an E-mail or leave a comment below I'd be grateful, and I'd add the stores to the list above. Thanks- I hope this is useful. I've probably been to Napa a half dozen times over the years and Sonoma another few times. Whenever I put together an itinerary, I spend way too much time thinking about it. Similarly as when faced with a massive wine list at a restaurant, I want to take in all the options and make the perfect decision. It's tough making use of anecdotal advice in this space. A lot of people have a great tasting experience to tell you about, but often the experience was great because of who they were with, who they know at the winery, or a connection they have that enabled them to get in. Further complicating things is that everyone has different criteria as to what they're looking for in a wine tasting experience. The winery should be small, but they need to be big enough to have a tasting room. If they don't have a license to pour their wines, it can be a great experience but it won't be a tasting room that anyone can visit. It's great when you can meet with the head person in charge. For me, nothing beats the experience of discussing a wine with the person who understands every aspect of the brand. I like catching rising stars better than established producers. For me, they're a more interesting story. I'd like to see the wines highly rated by Wine Spectator. It's not that I need permission from Spectator to like a wine, but it's nice to have a 3rd party assessment of the wines that I can refer to prior to visiting. They should have wine available for purchase. 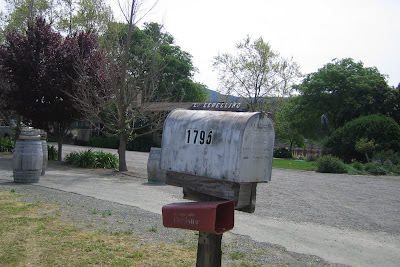 Some wineries are so mailing-list-only that there's really nothing you can taste that you can purchase. Against this, Buehler Vineyards is the best wine tasting experience I've ever had. Without any referral at all, without any special connection whatsoever I received an amazing personal tour from John Buehler. Their wines are consistenty rated 90+ points from Wine Spectator (Cabernet Sauvignon, Zinfandel, and Chardonnay) and their prices are reasonable. When I've recommended a visit to Buehler to others they too have had an amazing experience. What more can you ask for? 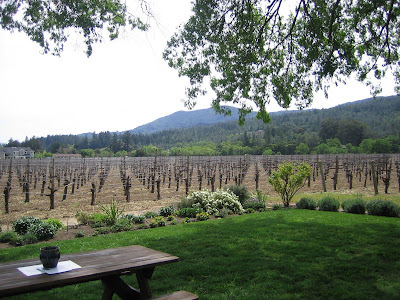 I recently visited Cliff Lede Vineyards. I also visited Lewelling Vineyards, which I would put on par with Buehler. An excellent small vineyard to visit in Napa. What are you looking for in a tasting experience? 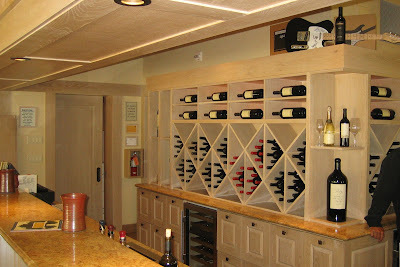 What are some of your favorite tasting rooms? Today is April Fool's Day so watch out for shenanigans in everything you read, especially online. The Wines of Chile reached out and supplied me with a couple of wines for review on this day and I thought to myself- maybe the joke is on me? The theme of the day is serious wines with non-serious labels. 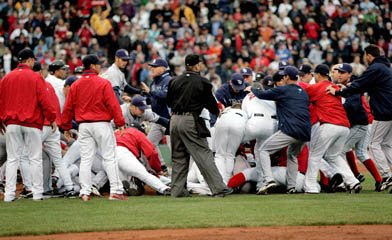 Here in the Boston area (with Red Sox opening day increasingly on our minds to symbolically mark the end of a long cold winter) I see wines like the Kevin Youkilis "SauvigYoouuk Blanc" (pictured below). I'm a huge fan of baseball and wine mash-ups (two of my favorite things!) but even so I think to myself- who buys this stuff? When I had a chance to taste a couple of Chilean wines from (oops) Wines, I didn't have lofty expectations. At best, I was hoping for something delicious and "guzzleable". They supplied me with a Chardonnay/White Carmenère white blend, and a 100% Carmenère, both with a suggested retail price of $12. How did they work out? The first night, we cracked open the white wine. The label promises tropical aromatics and the wine delivered. For a split second I was transported to another place and time- I was on a beach and loving life. I was very excited to taste this wine. However, when the wine hit the palate, something very bad happened. The wine veered dangerously closely to something that I really dislike in certain Chardonnays. I can't exactly put my finger on it, but there's this tendency that Chardonnay sometimes has that reminds me of a middle-aged woman lounging by a pool, replete with smudged lipstick and full of eccentric tendencies. It's this depressing combination of incompletely integrated alcohol within a white wine that I find particularly bothersome and this wine came so close to displaying it that it spooked me. As a result, I can't recommend it. Pass. Moving right along. The next night we had a red wine from the same producer, this time a 100% Carmenère. The lynch pin of the (oops) line is a take-off on something that really happened in the wine world. Carmenère was one of the original grape varieties allowed in red Bordeaux. However, while phylloxera decimated many of the vineyards in France in the late 1800s, it was able to survive unnoticed in Chile. If you have a Wine Spectator online subscription you can read more about this here and here. It wasn't until the 1990s that what was previously thought to be Merlot was actually Carmenère. This is all relatively recent stuff, having occurred in the past 20 years. At any rate, Chilean winemakers have hung their hat on Carmenère hoping that it would be their signature grape (similar to Argentina's Malbec, or Australia's Shiraz). And I have to say I have been very impressed with the affordable entries I've tried in the past few months. You can see a summary of reviews at the end of this piece (which include wines I bought at my local Whole Foods a while back). Imports of Chilean Carmenère to the US increased 23% last year, making it the second fastest growing grape variety among Chilean imports (behind Pinot Noir: never underestimate the "Sideways" effect). In Massachusetts, the (oops) line is distributed by Martignetti. I'd like to thanks the Wines of Chile for giving me the opportunity to sample these wines. If you're interested in hearing more about Chilean wines, you might also be interested in this piece I did comparing Napa Cab to Chilean Cab. Question of the Day: Have you tried these (oops) Wines? How about other Chilean Chardonnay or Carmenère?